Gemini, the third sign in the Zodiac, is the Twin. Those under the Gemini sign love to be organized and love to learn. They are ruled by the mind, and enjoy gifts that reflect their personalities. Here are a few gift ideas for the Gemini in your life. Since Gemini is a great communicator, cell phones, gadgets like ipad, laptops etc make it easier to communicate and are considered very good gift options for them. They love to be organized so a mini planner, diary or planning tool set with a nice pen would be a perfect gift too. Yellow is the color for Gemini and as the color symbolizes people under this star sign are never dull. Pearl is their birthstone, so a pearl set or ring will make a perfect gift for the Gemini women. They love information and travelling so a nice book or a gift voucher to the book store and travel accessories are a hit for them. For Gemini kids, games which involve learning and curiosity for the kid make a perfect gift. 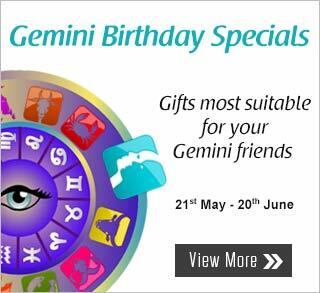 View our Gemini gifting special and send away gifts to your Gemini friends.